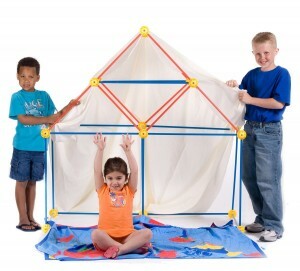 Home Kids Toys & Games Archive by category "Groovy Play Tents"
Tired of the kids being attached to electronics? 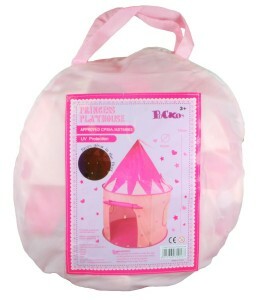 Get them a Pink Princess Castle Play Tent that will let their imagination run wild! It’s a known fact that all kids love play tents & forts so why not get them the coolest pink princess castle in all the land!? It’s great for rainy days inside or just leave it up all the time as part of your princesses decor. This durable tent is made just for kids so it’s nice & sturdy for years of hard kid play. It’s geared for kids age 3 & up but I don’t see any small parts so with younger kids playing in it make sure they are supervised…I would think climbing would be the only issue. 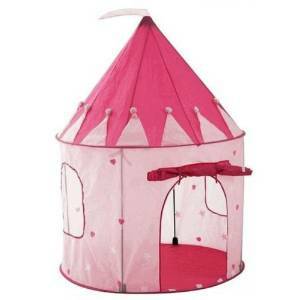 It features a two tone pink design that girls will adore, with small hearts & stars covering the bottom half of the tent. it comes with a floor so it’s Ok to take outside on nice days (I wouldn’t leave it outside permanently), it sets up in about 2 minutes & easily pops apart to store…it even comes with a carrying case to store it in. It has a front door/flap that can be closed with Velcro and two back “windows” to look out of. These are great to have around the house for grand kids, or other family with little people.it takes up very little storage space when not in use & small kids LOVE to camp in this thing. We have the circus tent version & the kids like to set it up for movie night & watch from inside the tent like they are at the drive in…it’s hilarious. Looking for a over the top cool toy for kids? Need something that is fun And isn’t electronic? These kits feature 54 pieces & can work with any of the EZ-fort building kits…which are the Bunker, Fairy Tale Castle & The Original (as shown). All the kits can use the BlingKeez LED lights. These are made by Toobeez but they are NOT interchangeable. You need to stick with the EZ-forts if you want more parts…which is great since the kits are rather affordable for their size. Because they are so awesome they can be used inside or out & all you need is a few well placed sheets to finish off the kids fort. They are designed to not scratch floors so they are safe to use almost anywhere. 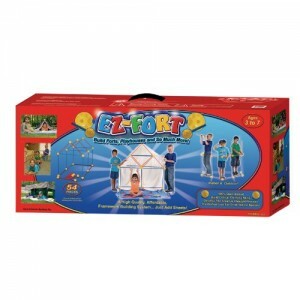 Ez-Forts are specially design for small hands so even little kids can play with this kit. It’s also great for working kids fine motor skills & they are designed to help promote problem solving & reasoning skills. They are used in schools, child development programs, occupational therapy programs & recreational programs all over the country. Making these the perfect choice for a creative kids toy. You’ll relive your childhood when you help your kids build forts, houses, obstacle course, soccer goals & whatever else they can think up. They won’t need directions to figure out this cool kit…just lots of imagination! You’ll wonder why you didn’t have these when you were a kid…I know I did! I actually recommend at least 2 of these kits, because we ran out of parts really fast & the kids needs more pieces….but mine are spoiled rotten.